Skiing with your toddler can be the best of times and it can be the worst of times. I remember taking my daughter to the mountain for the very first time. The sun was shining and she had this look of excitement in her eyes. 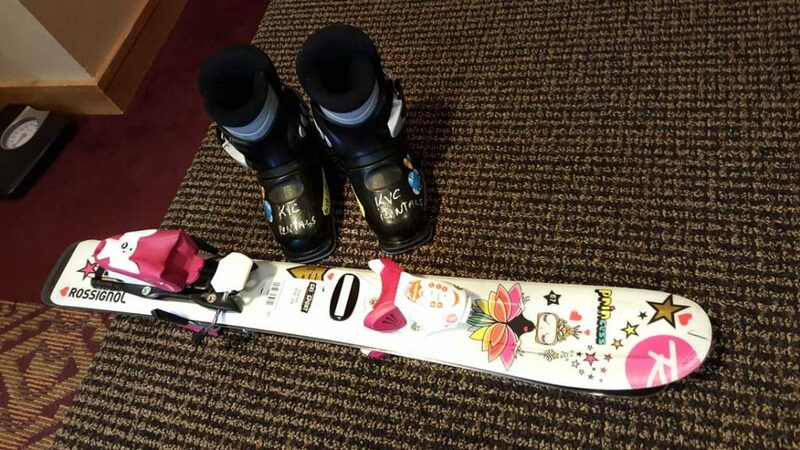 We don’t live in a snowy place though, so the idea of putting skis on your feet at such a young age can be intimidating, weird, and even scary. “Why are these long things stuck to my feet?” That is what I assume my toddler probably thought given the expression on her face. But teaching toddlers to ski can be a rewarding experience, albeit an exhausting one, for both the parent and the child. Teaching toddlers to ski can be exhausting for both kids and parents. We are a family of avid skiers. Even though we don’t live in or near the mountains, we travel at least 3 times each winter to ski. 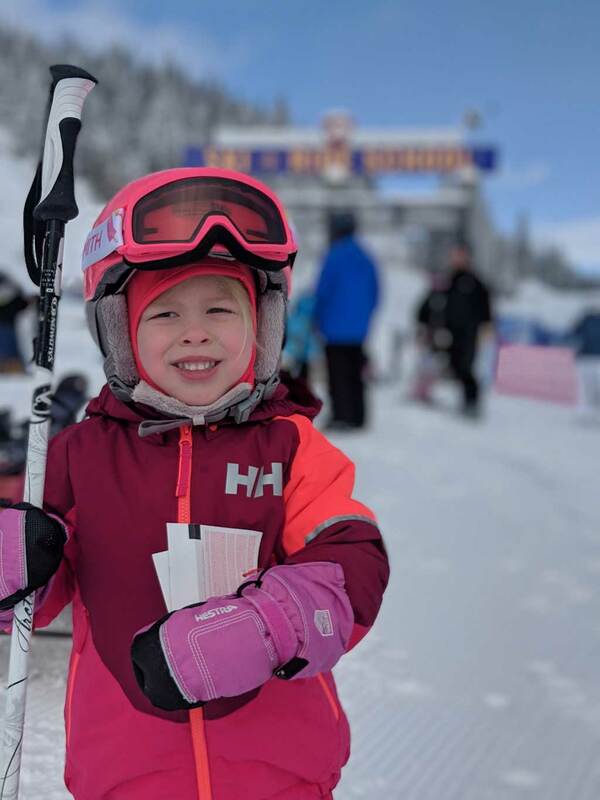 Over the last few years we have started to choose our skiing destinations primarily based on the family-friendly aspects of the resorts, including how easy it would be to teach toddlers to ski there. We first put our daughter on skis at 11 months old. She couldn’t even walk, so we weren’t expecting her to ski yet. 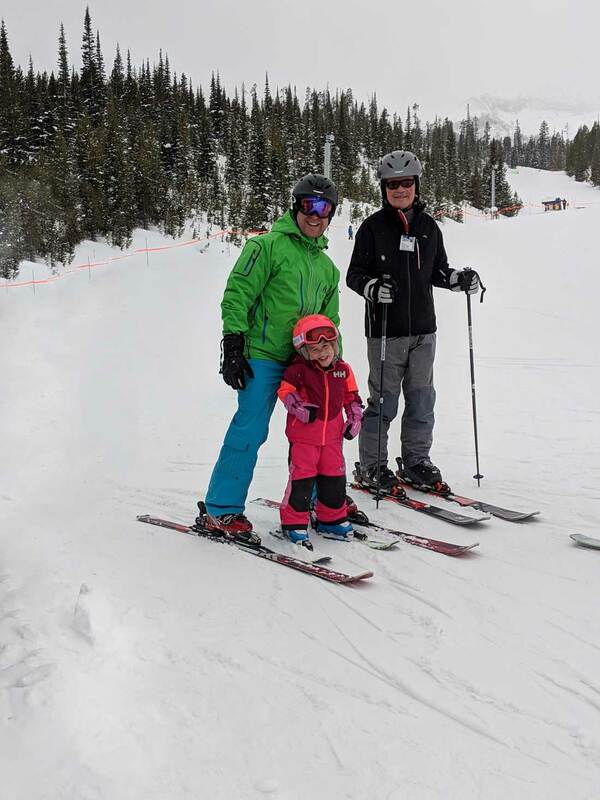 While it was a cute photo opp and something we may or may not have done just to say our daughter skied before she could walk, her early introduction to skiing actually had a larger purpose. We were exposing her to the feel of the sport, the gear, and the winter elements. Since then, we have put her on skis each winter and have seen significant improvement, not only in her skill level and ability, but in her confidence and eagerness to learn. What age should kids start skiing? 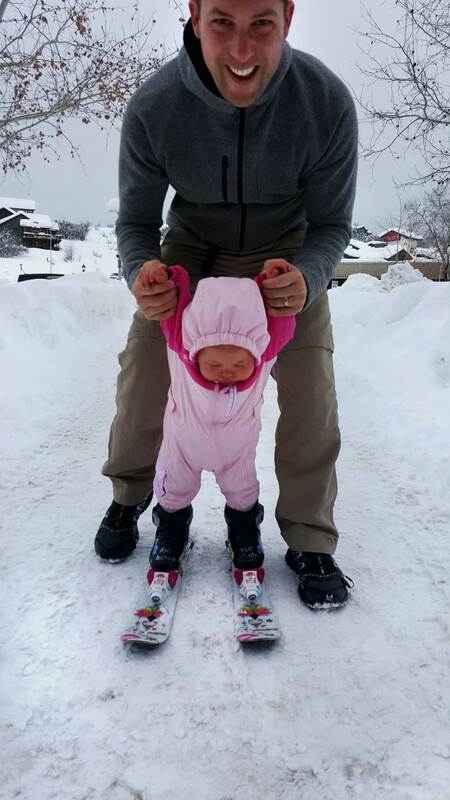 Despite putting our daughter on skis before she was even a year old, she didn’t actually start to get the hang of the sport or enjoy it until shortly before she turned 4 years old. We put her in a couple 30-minute private lessons at 2 years old, but those lessons were mainly to familiarize her with the sport. We also worked with her ourselves on numerous occasions. From putting on all the ski gear, to gliding on skis, to forming a wedge or pizza, we worked with her to help her understand and grasp the basics of skiing. But if she wasn’t enjoying it, we didn’t push her too hard. After all, you want skiing to be fun for your toddler. WHAT’S A PIZZA OR A WEDGE?! CHECK OUT OUR LIST OF THE TOP 50 SKI TERMS AND WHAT THEY MEAN HERE. 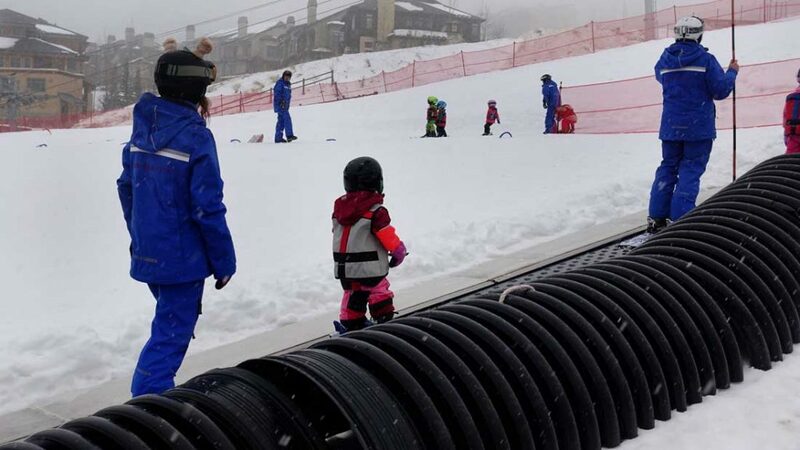 One particular day when my barely-3-year-old toddler decided she was done learning to ski after a full 5-minutes on skis, I sat on a bench near the resort base feeling defeated. A few short moments later a young ski instructor and a group of 5-year-olds came to rest on the benches near me. We struck up a conversation and I couldn’t help but ask the instructor at what age do kids “get it” and truly start to pick up skiing. The instructor glanced at my still sulking 3-year-old and said something that changed my perspective a bit. He said at least 30 percent of 3-year-olds learning to ski will basically cry the whole time. Only 5-10 percent will catch on almost instantly. He went on to explain that by about 4 or 5, most kids start to get the hang of skiing. This isn’t to say don’t try to teach your 3-year-old to ski. In fact, the more you expose a toddler to something like skiing, the better off they’ll be. The point I’m making is that you shouldn’t put too much pressure on your toddler. 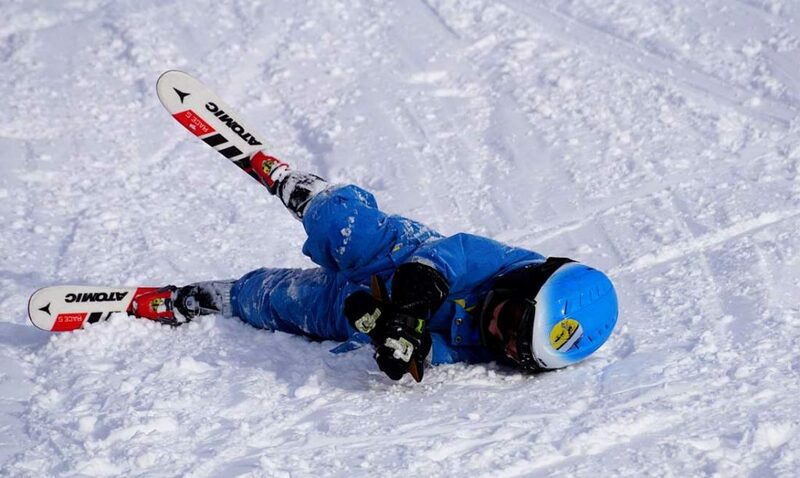 Chances are, you’re more likely to have a tantrum on your hands than a skiing prodigy. We’ve learned a few lessons the hard way about teaching toddlers to ski. But in talking to ski instructors and other skiing families, we’ve also received some valuable pointers about how to teach your kid to ski. Here are a few things to keep in mind when you hit the slopes with your child. Show your children all the gear, tell them the name of each piece, and help them to put it on. Let your child know what the gear’s purpose. This is an important part of skiing you don’t want to skip passed it too quickly. This “ski lesson” may be all you do for a day or so. In fact, the first day skiing, you may not even go outside. Make sure you have appropriately sized ski gear for your toddler. Some lessons start before you ever put on skis. We spent a lot of time with our toddler talking about skiing, showing her how to make a wedge with her feet, or how to duck walk to mimic how you would walk uphill in skis. This helps kids to understand the concept of skiing before they have awkward planks strapped to their feet. Have fun. That’s the most important part of the learning experience. Keep your cool. Your child will not want to go skiing with you if you’re raising your voice at them, losing your temper, or making them feel bad about themselves. Children, especially toddlers, are not used to spending extended amounts of time outdoors in cold weather. When teaching toddlers to ski, take frequent breaks. You may have to break your day up an hour at a time. Head indoors for potty breaks or simply to warm up. Stop the lesson from time-to-time and let your little one play in snow and just have fun. 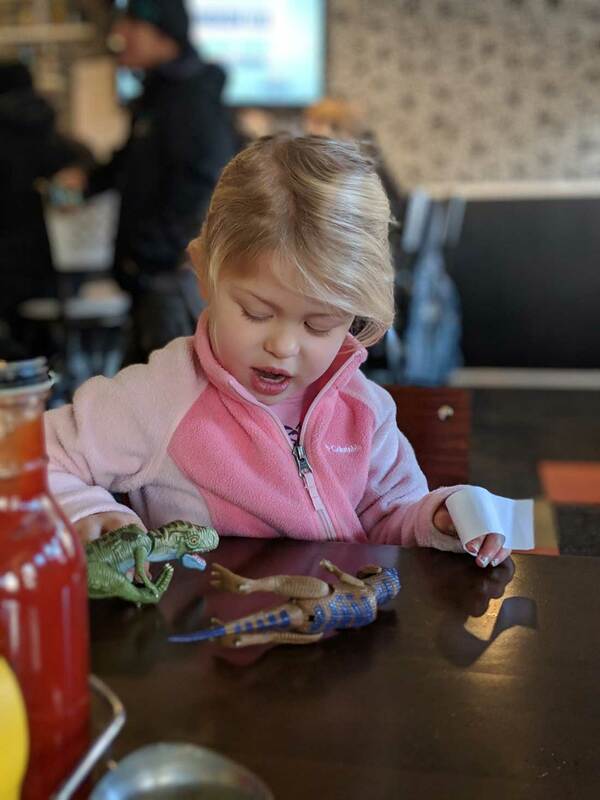 Plan for multiple trips to the lodge and an early end to the day if your toddler gets cranky or tired. One of the most important toddler skiing tips is to make it fun, take it slow, and play in the snow. Do not cram too much into the day or even the trip. Learning to ski takes way more energy, both mentally and physically, than a seasoned skier likely expends all day. (Remember how hard it is to stand up on skis after a fall?) Your child will be using muscles they haven’t really used before and is wearing clunky gear he or she is not entirely used to yet. Kids will fatigue easily when learning to ski. So, don’t expect too much. If your hope is that your child will want to ski again someday, you will need to take time at their speed. Not yours. Understand that you’ll be spending a lot of time on the greens. And I mean, a lot. Those bunny slopes are your new cruising runs for at least a ski season or so. Get used to it, but look into the future. Know that time on the greens now will mean time on the blacks (or at least the blues) together later. Our toddler was terrified of falling. The first time she fell on skis you would have thought she broke a bone because she was so upset. In reality it was just a harmless tip over, but it was terrifying for her. Don’t make light of their fears, but help them to understand falling is OK and expected during the learning process. You may need to fall yourself so that they know it’s OK for them, too. Once they understand falling at a slower speed doesn’t hurt them and doesn’t equal failure, they will gain more confidence and embrace this inevitable part of learning to ski with more ease. Not everyone will agree with me on this one. But teaching a toddler to ski sometimes takes a little coaxing. When we were on ski trips, we would let our daughter pick out a toy each afternoon if she skied that day. She had her eyes on the prize and therefore she worked really hard, even if she didn’t feel like it. She didn’t always want to ski each day, but she wanted the toy and so she would give skiing a chance. Some call it bribery. I call it rewarding her effort. Our toddler playing with her new toys after a day of skiing. Teaching toddlers to ski is much easier if you purchase a few inexpensive items. This must-have ski gear will help toddlers understand the concept of skiing, hold the correct position, and control their speed. 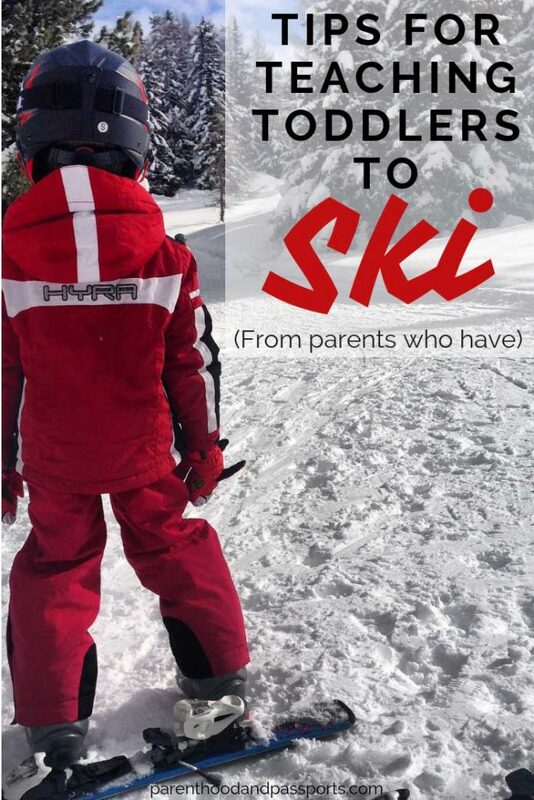 Here are a few must-have items for teaching toddlers to ski. This small rubber band attaches to the tips of your toddler’s skis. It is designed to keep the tips of the skis from flailing outward in a reverse wedge. Toddlers don’t necessarily have the muscle development in their legs yet to keep their skis positioned in a pizza or wedge, so the edgie wedgie helps them to maintain that beginner-skier position, as well. Controlling speed and stopping are the first things one must master when learning to ski. If you are skiing with toddlers or young children who are learning to ski for the first time, it’s a good idea to invest in a ski harness. The ski harness goes on your child and has straps that you can hold from behind. This way, as the parent or ski instructor, you can help them to control their speed and slow them to a stop when necessary. But try to leave them in control as much as possible. They shouldn’t become dependent on a harness. Once they have their confidence, take the straps off the harness. You can still keep the actual harness on them though in case you need to grab them from behind if they begin to lose control. Skiing is a dangerous sport, so a helmet is a must. Even if you don’t plan to leave the bunny slope. Simply put, even if you can control your toddler on skis, you can’t control all the other skiers on the slopes with you. In the scary event of a collision, a helmet can save a life. Proper ski attire will keep kids safe and warm while skiing. As with any sport, you need to dress appropriately for skiing. 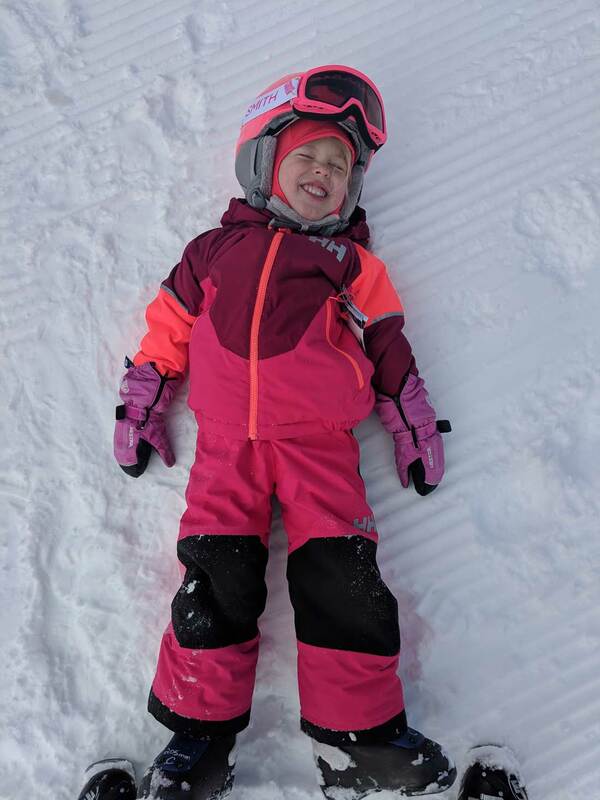 Without proper ski attire, your toddler may get cold, uncomfortable and spiral into one of those characteristic toddler meltdowns that come with this unique and sometimes challenging age. FIND A COMPLETE LIST OF WHAT TO WEAR SKIING THE FIRST TIME HERE. 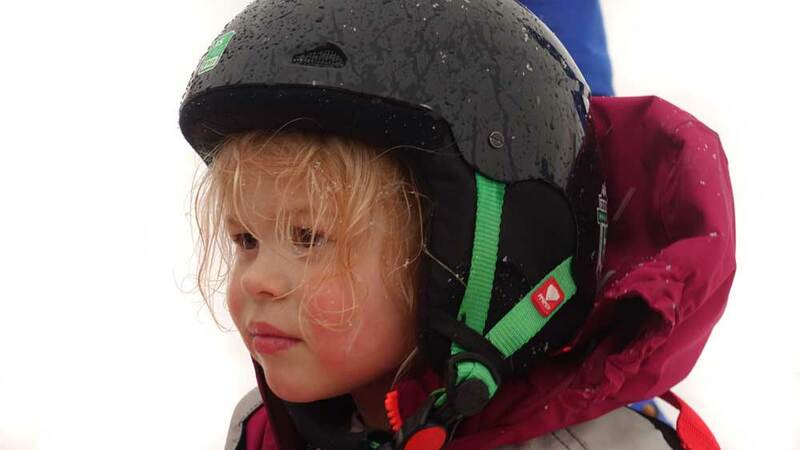 Should you invest in ski lessons for toddlers? 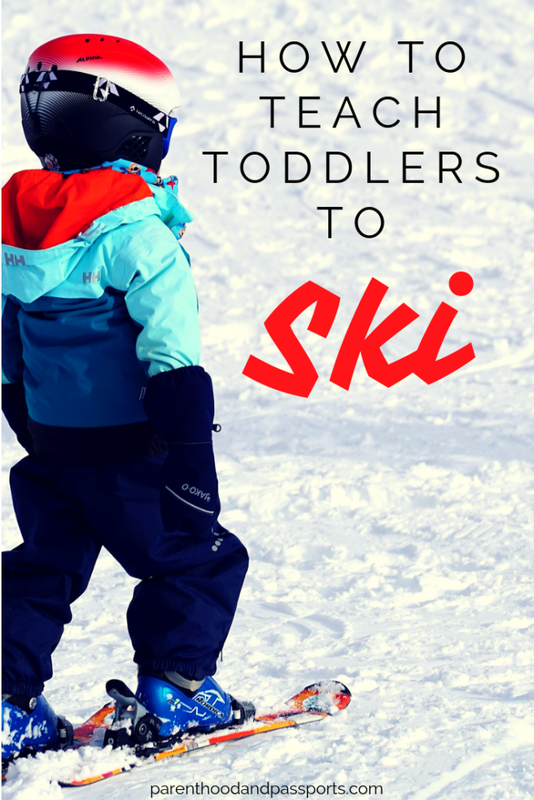 We are huge advocates for ski lessons for toddlers and beginner skiers of any age. 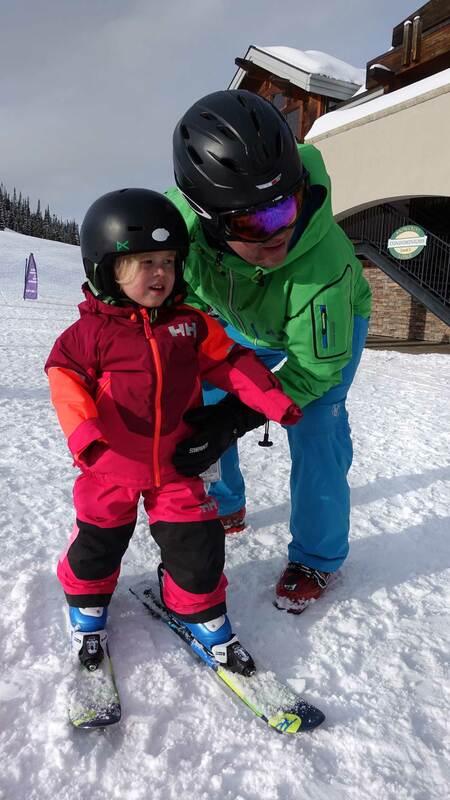 A ski instructor can assess your toddler’s skill level and help them to progress faster than parents may be able to do on their own. We have found our daughter takes instruction and is much more willing to listen to her ski instructor than to us. Our toddler in one of her first ski lessons at age 2 1/2. Additionally, beginning around 4 years old, your child can take group lessons with other kids their age. (Our daughter started group lessons just shy of 4-years-old.) Seeing what the other kids are doing will not only help toddlers learn how to ski, but it may encourage them to want to learn how to ski. Teaching toddlers to ski can be life-changing. Skiing is one of the few lifetime sports that you can enjoy well into your 70s and 80s. Furthermore, it’s a sport the entire family can do it together. Children, parents, and even grandparents can all ski together. It’s a sport that allows you to bond as a family and create unforgettable memories. Skiing also instills confidence in kids. It teaches valuable problem-solving skills and the importance of spatial and conditional awareness. And it’s a great workout! 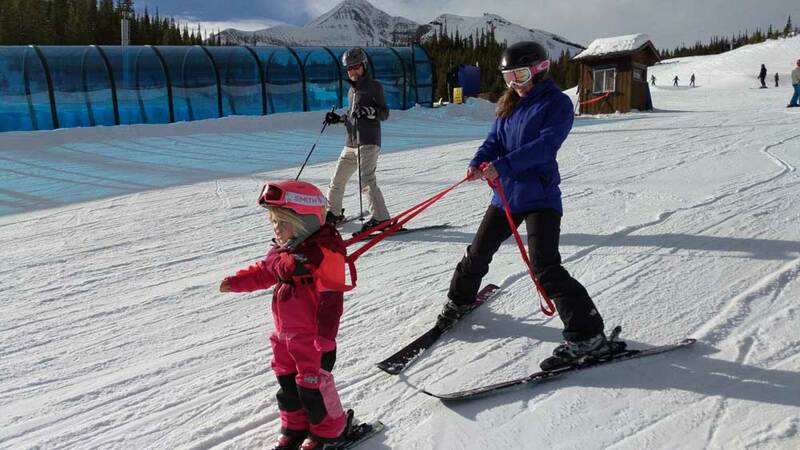 By teaching toddlers to ski, you are ultimately helping foster a healthy lifestyle and a love for the outdoors. Have a question or comment about teaching toddlers to ski? We’d love to hear from you. Leave your thoughts in the comments below. Travel doesn’t have to stop once you have children. We’re living proof! 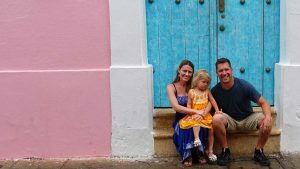 We’re Damon, Melissa, and Avery… just a normal family who has been bitten by the travel bug. We travel every chance we get and aim to be a resource for other parents to help families travel safely, easily, and boldly with kids in tow!